New Birmingham City owner, Carson Yeung, has a dream â€“ but weâ€™re not sure itâ€™s one that will help Blues fans sleep any easier tonight. Apparently, the Hong Kong-based tycoon wants to eventually put out a team featuring 11 Chinese players. He obviously hasnâ€™t had a chance to meet potential signing and pie eating ambassador, Mido, yet then. Although our Far Eastern friends are fast and skillful they donâ€™t have the most rugged of physiques and, with an average height of around 5ft 7in, corners could be a problem. What do you think? It could lead to something really stupid (playing someone because they’re chinese and not skill) or it could lead to some chinese player getting a chance and excelling and raising the Chinese game and Birmingham. It really depends on how they do it (sending chinese kids to the academy & giving players trials that the coaching staff can give a thumbs up or down or insisting a certain player be in the squad or starting 11- one is worse than the other). But getting an all Chinese team in the prem isn’t really going to work. 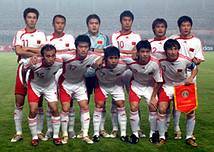 11 chinese players on various teams spread out and 2 or on one team, sure, but limiting yourself to one talent pool- silly and likely disasterous. Only team I know that actually has a nationality policy are Chivas Guadalajara and Saprissa (Mexican and Costa Rican respectively). And they manage it by running excellent academies for locals and being willing to pay inflated transfers for players of the right nationality to maintain the policy. Chivas USA’s attempt to create an all-hispanic team with MLS rules (especially regarding domestic players) was a catastrophe and a Chinese players rule for an English team could be a great disaster. Hey, there are some who say an english players policy in England would be a disaster and you don’t have to deal with work permits, culture shock and a smaller pool of quality players. Such a rule might work in China, though, if someone were willing to put in the effort. Also GP it’s not racist to talk about proven facts and I’m pretty sure that the average Chinese height would be close to 5 7. I’m sure you’ve said once or twice all Portuguese/Spanish/Brazilians etc. dive and if this article is seen as racist then saying something like that would be too.